To start with the first Patlabor would have to be one of my all time favourite movies and upon seeing it again you can really see that the animation at that time was quite primitive compared to today�s standards. Although the people animation was a bit higher than Astro Boy standards you will find that the animation of the Patlabors them selves (the machines) is phenomenal, the amount of detail that goes into creating these huge machines is really intense, and when those action scenes come on the animation team really have something to be proud of. The story revolves around a precinct of police officers, the officers aren�t just ordinary beat cops these cops drive the most sophisticated domestic armoured Patlabors around, they patrol the streets of Tokyo, and with a new threat in the city they�re job just got harder. The terms Patlabor sabotage has become a common term used in today�s society and recently a term will be added, with Patlabors going completely crazy and even being unpiloted still manage to get command from their HOS (Hyper Operating System) . The majority of Patlabors around have just been upgraded to a new and sophisticated operating system named the H.O.S (Hyper Operating System). The new system was devised by a young brilliant systems analyst who has just recently committed suicide. It is believed that the young analyst was a bit crazy but the government didn�t mind because the new HOS interface improved the Patlabors power output level by 30% making the Patlabors faster and more efficient. What they didn�t realize was that the young analyst actually built in a virus that allowed all Patlabors with the new operating system to go on a rampage and destroy the world. The police must now find the trigger for the virus and try their best to remove it from as many Patlabors as possible. This makes for an amazing ending and with many plot twists and turns I guarantee that if you�re into the action type animation movie Patlabor 1 you can�t go past. The second movie, Patlabor 2 really doesn�t push as many buttons as the first, you will find that the animation and the sound quality is just as good if not better, but the story line is very much more intense, you will have to pay attention, you can�t just watch bits and pieces and expect to understand what�s going on, in other words don�t watch it with guests unless they are die hard anime fans like yourself. 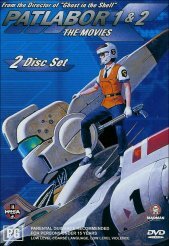 The story is more of a government conspiracy after the end of Patlabor 1 and how they intend to quell the Patlabor shortage in the world and also the way that certain government agencies have manipulated the Patlabor crisis to make the city of Tokyo a target for attacks and a real fuel for the coming war. Someone is trying to start a war and the crack team that prevailed in Patlabor 1 is out trying to solve the mystery and catch the culprits. I�d have to say that the movie isn�t as good as Patlabor 1 but it still holds a great presence and you really can�t go without seeing both, just seeing one of the Patlabor movies would be an insult and you would surely suffer, this great double pack is fantastic value for money and anyone out there that enjoyed either of these movies, I urge you get out there, get the double pack and enjoy the ride. Don�t miss out on the extras there are some pretty sweet trailers of mechanoid series, the second disc includes a making of the Patlabor movies, it�s very good except you have to read everything because all the animators are all Asian dudes and so are the writers, so to that effect you have to read subtitles, but still pretty cool the way they involved real life scenes to create the Patlabor world.